Avenue de President Wilson, Paris. 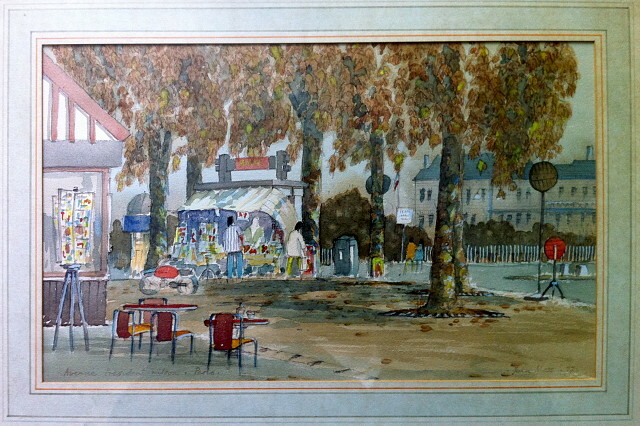 Way back in the silver jubilee year of '77, while I was celebrating my 6th birthday at the Welcome Home field in Mistley, my architect Grandfather, turned watercolour artist in retirement was capturing this Parisian Scene. The avenue is dedicated to the American president Woodrow Wilson. In the late stages of the great war, Wilson took personal control of negotiations with Germany, including the armistice. He went to Paris in 1919 to create the League of Nations and shape the Treaty of Versailles, with special attention on creating new nations out of defunct empires. Largely for his efforts to form the League, he was awarded the Nobel Peace Prize. In 1919, during the bitter fight with the Republican-controlled Senate over the U.S. joining the League of Nations, Wilson collapsed with a debilitating stroke. He refused to compromise, effectively destroying any chance for ratification. The League of Nations was established anyway, but the United States never joined.